The American Memory is the digital collection portal for the Library of Congress. The website is to provided “free and open access through the Internet to written and spoken words, sound recordings, still and moving images, prints, maps, and sheet music that document the American experience. It is a digital record of American history and creativity. These materials, from the collections of the Library of Congress and other institutions, chronicle historical events, people, places, and ideas that continue to shape America, serving the public as a resource for education and lifelong learning.” For the genealogist, American Memory is an opportunity to read, hear, and view life in the late 19th and early 20th centuries. American Memory to read and view materials from generations past to better understand your family’s history. The some of the main categories are: First-Person Tales of California, Life in the City 1898 to 1906, Panoramic Maps, and Early Virginia (Documents spanning 1776 to 1865 include wills, naturalization, deeds, and manumissions of slaves. 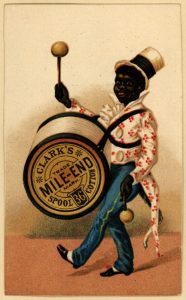 On the homepage provides information about finding African-American names), Advertising (1850-1920), Folklore, Immigration, Sports and Native American History. Just click on a topic to the left on the homepage to explore what is available. Many of these topics plus some new ones, the Library has recently switched to other presentation sites. An excellent category in the collection is the drawings of selected towns and cities. If you had ancestors in the tow during the time frame listed you do have a treasure. Some of the 52 drawings featured are NYC – Brooklyn in 1851, Philadelphia in 1868, and Washington, DC in 1880 and New Brunswick, NJ in 1880. Looking over the category of American Advertising can be fascinating and provide insight to the products your ancestors may have used. Many of these products and brands are still used today. So much to explore in the Library of Congress online, especially those featured in American Memory. Photos: Bird’s-eye view of New Brunswick, New Jersey in 1880; Ad for Kodak camera in 1890; and AD for Clark’s Spool Cotton thread from 1880s.